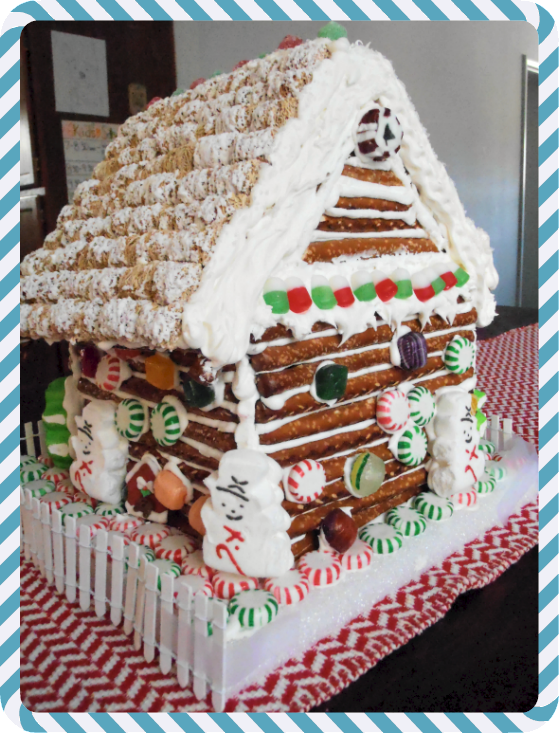 It is day four on the gingerbread log cabin project, and I think we are finally done. What I thought would be a two day project has turned into four. 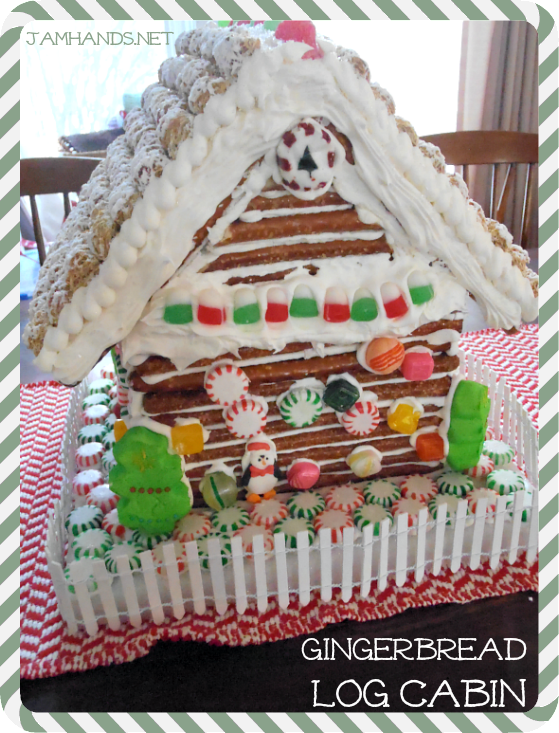 This was our first gingerbread house so I was winging it as I went. I learned that if you are doing a pretzel log cabin, you should make a template out of cardboard for the entire house, hot glue it together, and use that for your starting point. I did not. Instead I built it up, one pretzel rod at a time, using only the icing to hold it all together. The first icing recipe I used, the one NOT listed below, was much too fragile and didn't hold things together like it should have. That was an egg white and powdered sugar recipe that gave no instructions for just how long you needed to beat the mixture for. I have listed below the improved recipe, one that I used on days three and four to do the roof and miscellaneous piping around the roof. The texture is really great. For the roof, I used a cardboard cutout we measured to fit the house and I used icing to 'glue' pieces of graham crackers. 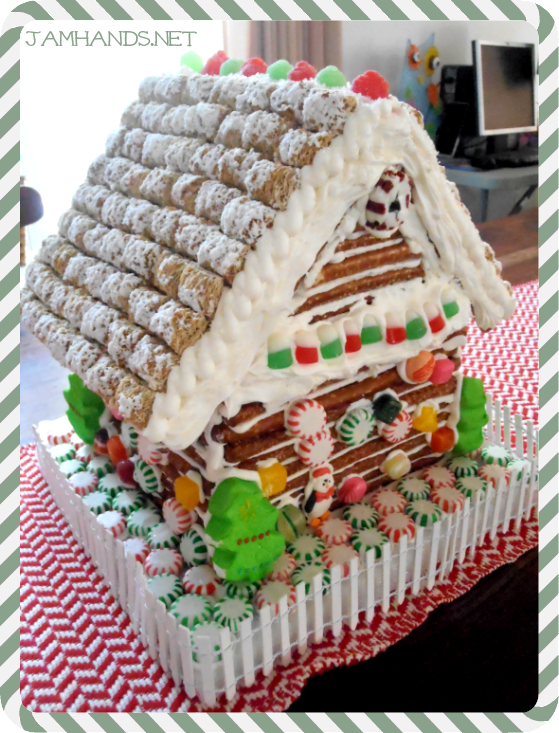 Once that dried overnight, I added the frosted mini wheat cereal to complete the roof. You can't see it very well but I added sparkling sugar to the icing around the roof edges to give it a more snow like appearance. Finally, we forgot to add a front door. Ah well, next year. 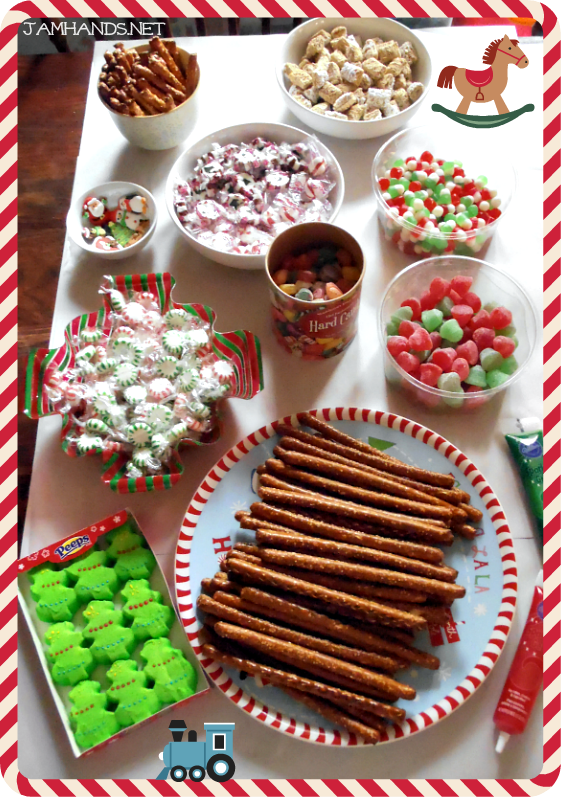 For the materials, we got almost everything at Walmart in the holiday candy isle. They had a lot of bags of peppermints, gumdrops and the like to use as decorations. Speaking of next year, we are going with a traditional gingerbread. After the frustration that is pretzel rods, although they look cute, never again gonna happen. Beat with an electric mixer for 6 minutes. This is a work of art. Love it.